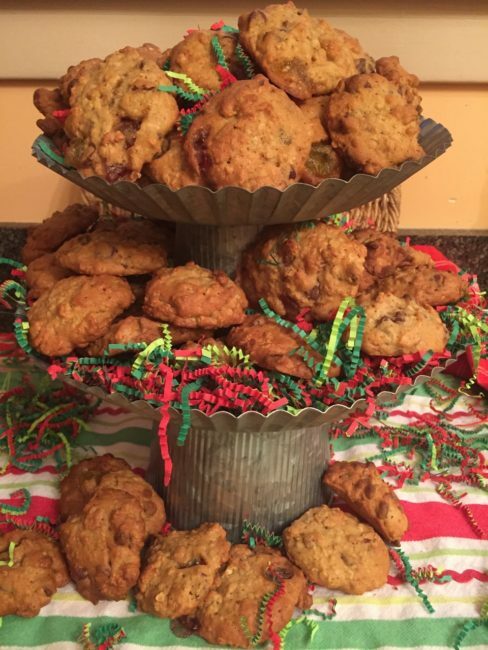 This cookie recipe recently made it into the top 10 in the Los Angeles Times 2016 Holiday Cookie Bake-Off Competition. The results are not yet in as to the winner, but as December 4th is National Cookie Day, we are sharing this recipe with you now. It was mid-November, and the Christmas candy was out in every store, but no gumdrops! I spent an entire Sunday afternoon driving around looking for gumdrops to make my Nana’s Old Fashioned Christmas Oatmeal Gumdrop cookies. Apparently, this candy has fallen out of favor (at least in our neighborhood). At home, I jumped online and discovered that gumdrops come in various blends. Who knew? I had to decide, did I want the Christmas blend? (cinnamon and wintergreen); the spice blend? (clove, cinnamon, licorice, spearmint, sassafras, and wintergreen) or the plain ones? (cherry, orange, licorice, lime, lemon, and pineapple). 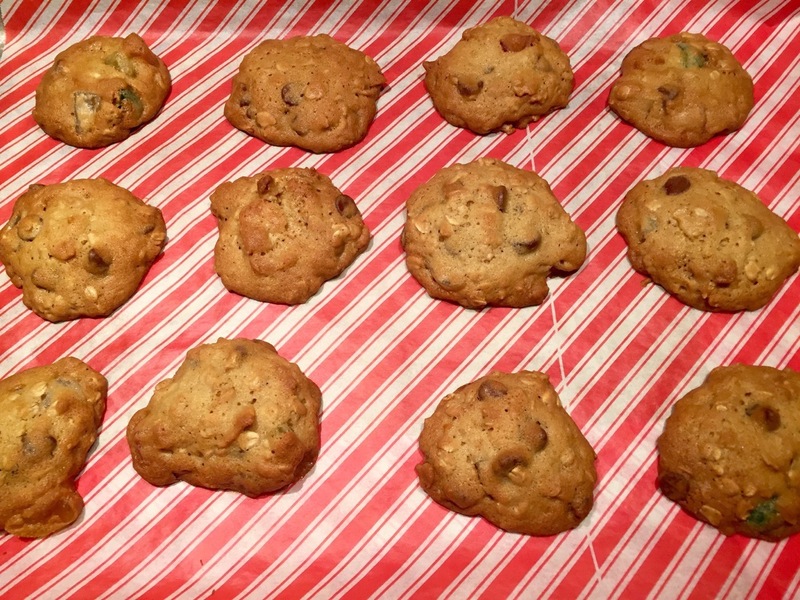 So I did what any good cookie maker would do, I purchased two bags of each…one bag for tasting and one for baking. Six pounds of gumdrops on the way to MaiTai Tracy’s Kitchen! A little background …. My Nana was an excellent cook, and she was an especially good baker. Unfortunately, I did not inherit her baking skills except for this recipe which she used to make every year at Christmas (along with persimmon cookies which we would not touch with a ten-foot pole). As a kid, the best part about these cookies (other than eating them) was the cutting of the gumdrops. Nana would set me down with a bag of gumdrops, a pair of scissors and a cup of hot water (so the gumdrops wouldn’t stick to the scissors) to do the cutting. But first, you had to pick out the licorice gumdrops which we were told would overwhelm the flavor of the cookie. However, that just also happened to be her favorite flavor and she never would share those gumdrops (Now that I think about it, maybe that was just a ploy so she could have the licorice ones, sort of like my mother who would dump our French fries together into one bag so we could “share”). My six pounds of gumdrops arrived, and I promptly took them to work for a taste test to see which ones I should use in this recipe (thank goodness for co-workers). My mom and I recall that Nana probably used the plain variety of gumdrops. 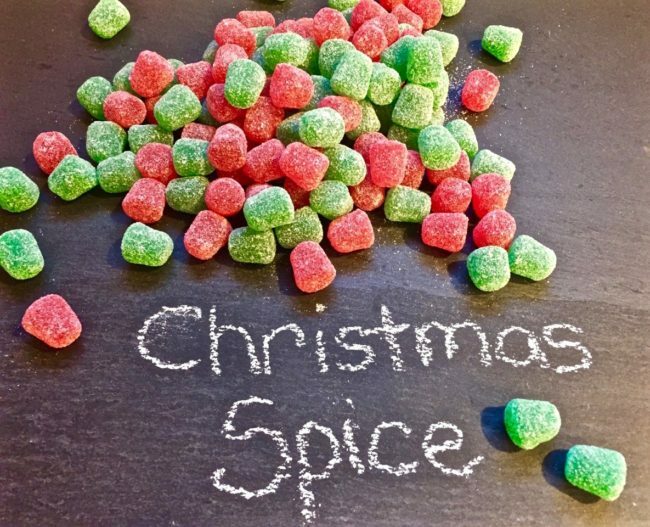 There was a tie between the plain gumdrops and the Christmas blend, so I made a batch of each flavor. Fortunately, these cookies freeze really well. BTW big shout out to Nuts.com for their gumdrop selection. 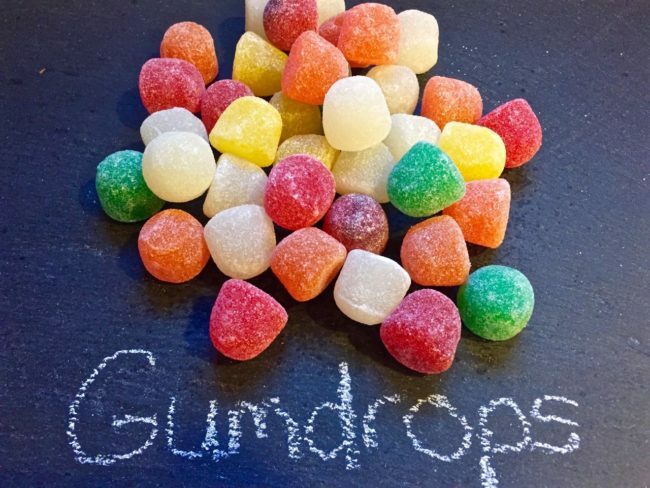 These are the best-tasting gumdrops I have ever tried. 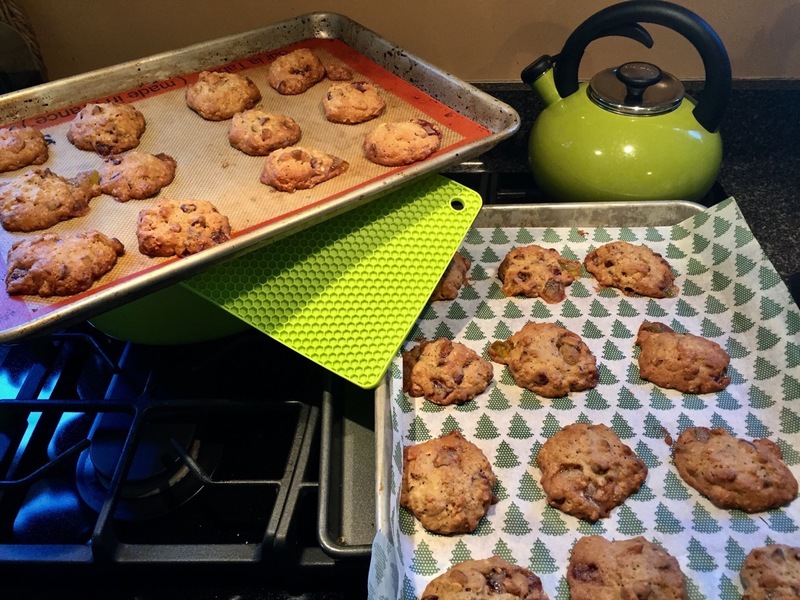 On the last note, it is very important that you line the cookie sheet with parchment paper or a Silpat otherwise you are never going to get the gumdrops off the sheet after they have baked without a great deal of elbow grease. 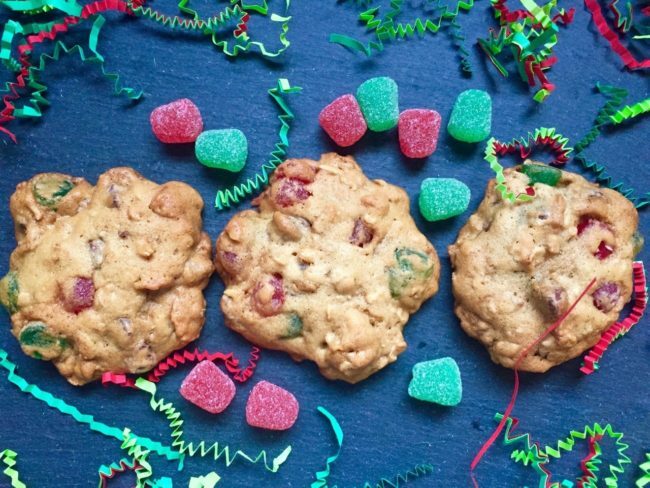 These cookies are like all your favorite cookie recipes rolled into one, and then gumdrops added for festive color and yummy chewiness. I hope you enjoy our family favorite! Combine flour, soda, and salt together in small bowl. In a large bowl, cream the margarine and sugars until light and fluffy. Mix in the eggs one at a time and then add vanilla and hot water until just blended. Gradually mix in the flour mixture in three parts. Add remaining ingredients, one at a time, starting with the oatmeal. Drop by heaping tablespoon, about 2 inches apart, onto a cookie sheet lined with a Silpat or parchment paper. Bake 10-12 minutes @ 375° until lightly browned and golden. Let cool on the pan for about 5 minutes before removing to a wire rack to cool completely.